3 COMPETITIONS – 3 GREAT PRIZES | Marbella Marbella – Adelante! 1) One of Steve’s CDs. 2) 2 TICKETS to CHIC with NILE RODGERS supported by ODYSSEY and JAKI GRAHAM in Concert on 3rd August. 3) 2 TICKETS to SIMPLE MINDS at the Starlite Festival on 9th August. COMPETITION 1 We are giving away 6 of Steve’s CDs (or a free download if you prefer). To enter the draw simply answer the following question. IN WHICH TOWN WAS STEVE BORN? Please email your answer to info@slmlive.com (HINT: Read one of Steve’s blog posts of 1st July – http://www.slmlive.com/blog) Closes midnight 31st July. The winners announced 1st August. COMPETITION 2 WIN TWO TICKETS TO CHIC in concert – Disco under the Stars!! at Puente Romano on Friday 3rd August. To enter the draw to win answer the following question. HOW LONG IS STEVE’S NEW ALBUM “IN MY FATHER’S FOOTSTEPS”? Answer: a. 3148 seconds, b. 3348 seconds, c. 3568 seconds. (an easy one if you click the correct link below!) Please email your answer to competition@slmlive.com Closes midnight 31st July. The winner announced 1st August. 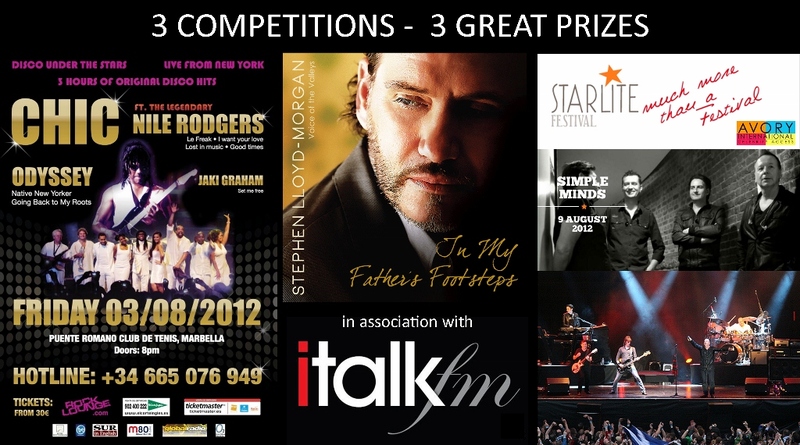 COMPETITION 3 WIN TWO TICKETS to SIMPLE MINDS concert at the STARLITE FESTIVAL on 9th August. To enter the draw to win answer the following question. ON STEVE’S ALBUM “IN MY FATHER’S FOOTSTEPS”, WHICH VERY FAMOUS PERSON IS TRACK No.6 ABOUT? Please email your answer to competition3@slmlive.com Closes midnight 6th August. The winner announced 7th August. The concert tickets are kindly donated by each event organiser after hearing of Steve’s efforts to raise funds for Cudeca & also thanks again to everyone at italkfm for all their continued support. Please buy now to support the http://www.cudeca.org & http://www.tenovus.org.uk cancer charities. REMEMBER 100% OF SALES INCOME WILL GO TO THESE CHARITIES.